Robert Mugabe is intent on transferring Zimbabwe’s economy back into the hands of Zimbabweans. 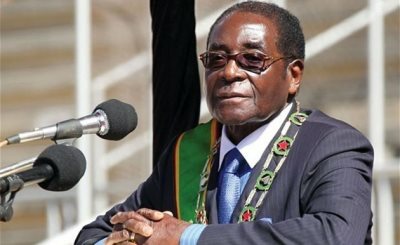 AFRICANGLOBE – Zimbabwe has given foreign firms just over a week to cede majority stakes to Zimbabweans or face closure. Critics say the move will discourage foreign investment in an economy which is struggling due to illegal Western sanctions. The government adopted the legislation in 2008 to compel foreign firms to cede at least 51 percent to promote Black ownership and correct imbalances from the colonial era. However, this law is often not adhered to. This latest move to implement the Indigenisation and Economic Empowerment Act was announced on Wednesday (23.03.2016) by Empowerment Minister Patrick Zhuwao. Some companies have “continued to disregard” the law prompting the government’s order to close non-compliant firms, Zhuwao said. “It’s either you comply or you close your shop,” he added. Foreign companies in Zimbabwe include mining operations, such as platinum producers Anglo-American Platinum and Impala Platinum and banking groups Standard Chartered and Barclays. The two platinum producers have previously submitted empowerment plans to be considered by President Robert Mugabe’s government. Zhuwao said he did not have details of which companies had complied with the law and would therefore not be banned. Critics say the indigenization law scares away much-needed foreign investment. “It is a decision that is most likely to affect the Zimbabwean economy very negatively,” economist Prosper Chitambara barked. He was referring not just to the prospects of attracting foreign direct investment, but also to the loss of output by companies that would be forced to close and shed jobs. Foreign direct investment refers to investment made by a company in one country into a company or entity in another country. Zhuwao denied there was a link between this and Zimbabwe’s economic problems. “This argument that says this country is crying for foreign direct investment is not true,” the empowerment minister said. “We are a market driven economy and when there is a vacuum others will come in,” he added. Mugabe has threatened in the past to nationalize foreign companies that refused to comply with the law.